Step 4. 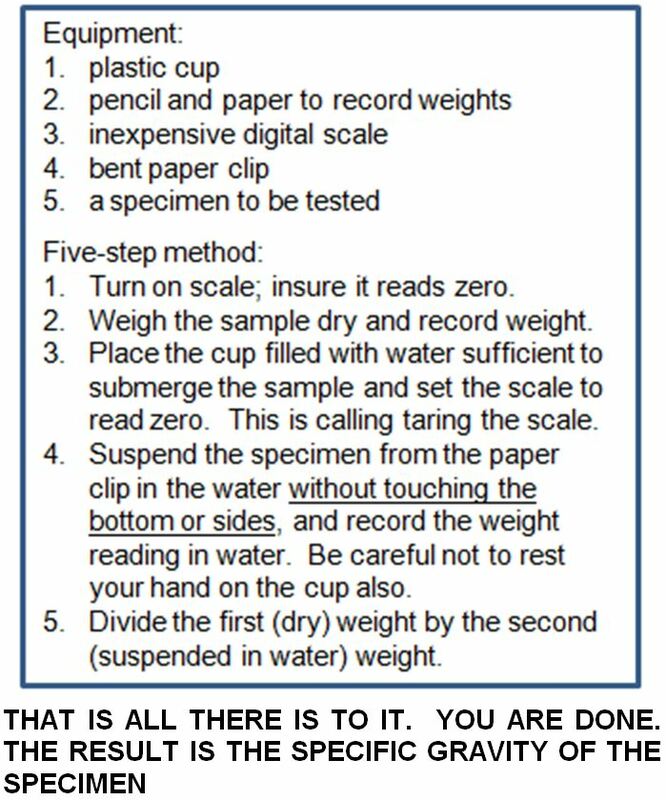 The sample weighs 6.7 in water. 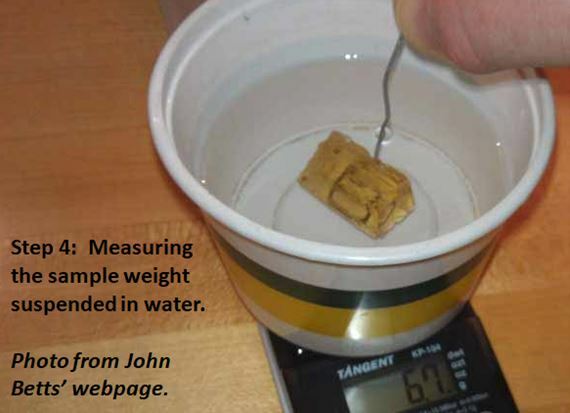 This same sample weighed 17.6 when placed directly on the scale dry. 17.6 / 6.7 = 2.627. This mineral is scapolite, with a sg of 2.5 to 2.8 depending on the percentages of end member marialite (Na) and meionite (Ca). With the lower value here, it is likely towards the marialite end member. OK, but you might ask, what is specific gravity? Specific Gravity (or sg) is the ratio between the density of an object, and a reference substance. With minerals and most substances, we use pure water as our reference substance. The units cancel so that specific gravity is unitless. 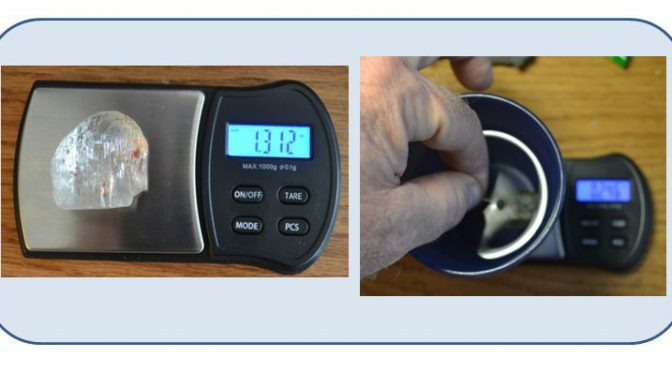 As long as you measure the dry and suspended weights in the same units, you can use grams, ounces, tons, carats, or your own made up unit. Because the density of pure water is 1 gm/cm3, the specific gravity of minerals is equivalent to the density when expressed in those units. But it is not the same. Density carries units; specific gravity does not. One caveat: The method will only work with pure substances. It will not work with specimens of mixed mineralogy or those that have started to alter, either externally or internally. Simple and succinct, but does it work? I decided that before I could place this method onto the pages of this esteemed blog, I must test the method myself. So I lined up nine known minerals and one unknown and went to work with my Harbor Freight scale, my little cup of water, and my slide rule (OK, calculator). After dropping my specimen off the clip a few times I experimented with string instead of a paper clip, but in the end I decided that carefully bending the clip to hold each mineral was a preferred method. 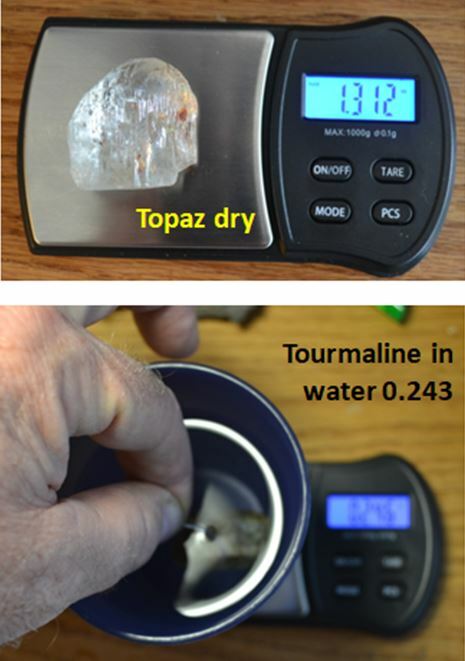 My scale and measuring technique showing a dry weighing of a topaz and a submerged measurement of tourmaline (var. dravite). So how did I do? 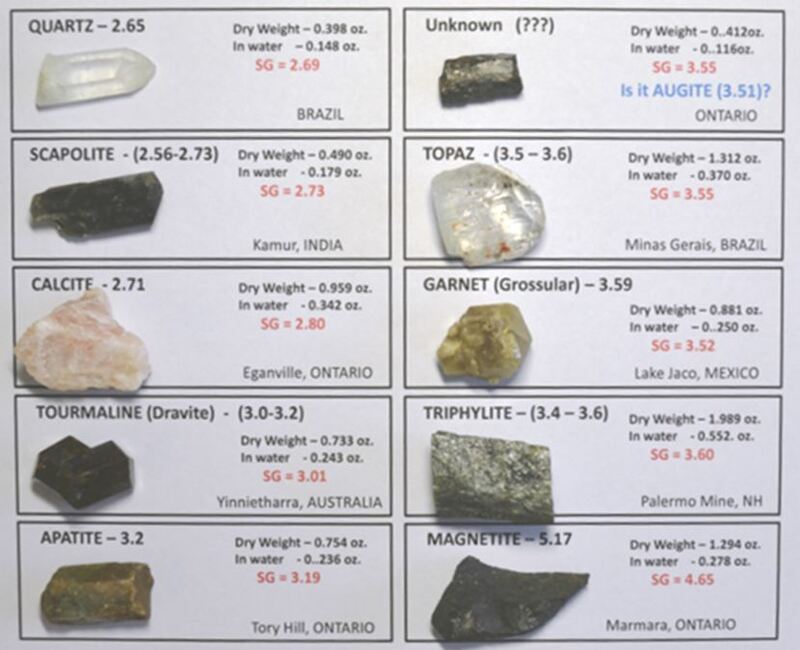 The chart below shows all the minerals I tested. They are ordered by increasing specific gravity with quartz in the upper left to magnetite in the lower right. Several yielded specific gravity results that match the known mineral values almost exactly. John Betts suggests one should expect measured values to be within 0.05 of the true specific gravity of the substance being measured. A few of my measured values fall outside that range. Let’s discuss some of those misses. Calcite is CaCO3 and has a specific gravity of 2.71. My specimen yielded 2.80 and was repeated +/- 0.02. A bit of magnesium in the calcite or some intergrown dolomite could be the culprit. Dolomite has a specific gravity of 2.84. Or perhaps the orange color or this calcite is caused by a heavy element like iron or manganese. Assuming you knew this was calcite, the specific gravity measurement is actually telling us that something heavy is present, but not what it is. The grossular garnet is a mild miss, outside the lower error of 0.05. Careful inspection of the piece shows a small amount of a second mineral on the backside, perhaps calcite. A simple spot of acid confirmed this. I guess I could try to dissolve off all the calcite and retest, but I did not. The magnetite miss (4.65 measured vs. 5.17 actual) is the largest percentage miss of the bunch. But this is a weathered piece from the mine dumps at Marmora, Ontario. It is reasonable to expect some alteration. Oxidation to hematite cannot explain this as the specific gravity of hematite is 4.9-5.3, but incorporation of water or hydroxyl groups with minerals like limonite or goethite could. The small piece does look like solid magnetite though and I could not find a portion that was not magnetic. Scapolite is a solid solution between sodium end member marialite (sg: 2.5-2.62).and calcium end member meionite (sg: 2.66-2.73). The recorded measurement here of 2.73 suggests this specimen might tend towards the meionite end member in composition. Information about some tourmaline solid solutions (like the dravite-uvite series) might also benefit from similar analysis of specific gravity. Finally, Linda Schmidtgall found an outlier crystal while we were collecting almandine garnet in River Valley, Ontario. She actually had three, but only one was isolated sufficiently to permit the measurement. The crystal yielded 3.55, and its seems most likely it is a pyroxene, perhaps close to hedenbergite, the calcium-iron clinopyroxene which has a sg of 3.55.